Remember how optimistic I was back at the end of April when I was going around planting seeds and building contraptions for my morning glories to cover with rich foliage and brilliant blue blossoms? They just didn't do too well this year. They suffered from a dearth of sunshine and a plethora of rain. I tired to kid myself along, but as the leaves turned yellow and the flowers stopped blooming, I knew that this was a fail for this year. Then whole vines started turning brown - leaves and buds - and I knew the jig was up. During my regular Saturday morning flower maintainance rounds, I decided to put the thing out of its misery. I cut down the vertical part of the vines and strings and reached up to pull down what ever else I could. A good part of the horizontal structure remained waiting for a sweet young thing to come along with a ladder to take it down. If that's not spitefulness, I don't know what is. Stop me if you've heard this one before: it's raining again. Dear Pacific Northwest, Now I know how you feel - not depressed as much as aggravated. Your pal, Suzette. My flowerpots are not doing so well this year so in an effort to accentuate the positive, I moved the sun-lovingest flowers to the place where they'd get the most sunshine hours. As soon as I arranged them, it started to rain. After yesterday's periodic downpours, it dried off enough to sit on the deck and kick off the holiday weekend celebration. Sorry, Hoss - dogs not invited. The festivities continued with early morning activities today. First came the single participant event in which I picked up dog poop in advance of the arrival of the lawn mower guy and then the more challenging removal of a poison ivy vine by means of a long-handled clipper. I used the same body posture as if I was taking a glowing bar of Uranium-235 out of a lead canister. Later in the day, team events will take place. The high speed "Get Those Cushions Inside" relay race will take place as soon as it starts raining again. For those looking for a more vigorous competition, the highly anticipated "Fry Daddy Faceoff" will be held indoors, pitting the team of Oh No You're Not against the returning champion, Oh Yes I Am. It's a death match. There was a time that Sami was afraid that I'd find out he was smoking. Those were the days - he's very brazen about it now. 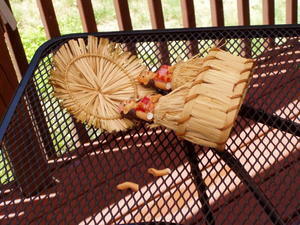 This morning when I went out to inspect the deck pots after last night's storm, I found this charming vignette. Now it might be that my quirky ideas about gardening ornamentation has rubbed off on him and this is his first attempt at guerilla art instalation, but somehow I don't really think so. I think he meant to be funny. Don't be going around feeling sorry for me because of my pitiful plants - there IS one happy little survivor here. This is the spider plant that She Won't Let Me Use Her Real Name got as a clipping from her science teacher when she graduated from high school. She took it off to her college dorm room every September and dragged its near-dead carcass back here every May. The deck seems to be the right environment for this thing. She brings it home extremely diminished in size with its color changed to yellows and browns. Last year, its whole life force depended on the single yellow leaf it was down to. We put it outside under the canopy, move it into the open when it rains and it makes a remarkable comeback every time. This year, it was only half reduced, but it was listing to the side at an alarming angle. Look what an excellent recovery it has made - blooming flowers and all. I don't know what to say about my deck pots this year. I love them, but nothing can live on love alone. What went wrong here? 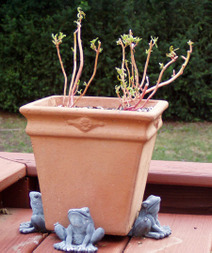 I gave them sun, I gave them water, I gave them Miracle-Gro potting soil mixed with yard dirt. 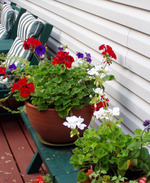 I'm haven't knocked off the geraniums yet but I can't grow a petunia to save my life. You now those "Wave" petunias that are so popular nowadays? I figured since I have an unbroken losing streak with regular petunias and the plant stake description was so encouraging about the easy-to-growness of it all, I took a chance and this is what happened. Its supposed to look like this. I don't know. This though - this is true evidence of my high regard for you, all you wonderful people out there in the dark. 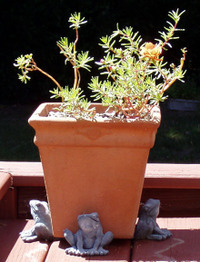 Look what I'm showing you - a pot of portulacas. I know - eek! , right? Who can't grow a portulaca? They grow themselves practically. I did buy them very late in the season, and they were kind of tired looking , all jammed together down on the gravel of a roadside stand. The lady behind the counter obviously made it up when she charged me $3 dollars for 5 cellpacks, and then quickly tired to get me to take a whole flat for $5 when I didn't protest at that price. She must have known something about their imminent demise. I tried to help them - I thought I might give them a squirt of watered down Palmolive dish detergent to rid them of any infestation they might have. Little fuzzy white patches raised their wings and took off at the first spray and this poor plant cluster was never the same again.I suspect that the bugs were what was holding it up. So there we have it. Now you know. I'm losing it. Bad plant skills. Bad knee. I don't know why I even bothered to get my teeth fixed. I could have lived this kind of lifestyle with my broken teeth and saved myself some trouble. Boo hoo. Gather 'round, friends. It's time for another of the countless recurring post topics around here - its the annual digging up of the sweet potato. Not that I'm anxious to say goodbye to deck season, but the Coleus Corner is gone past its prime as anyone can plainly see. To say that they have become leggy is an understatement. How leggy are they? I couldn't justify spending the bandwidth on getting the tops into the frame. That's how leggy. Start by clipping away the stems. As validation for emptying the pots now, I am relieved to see that the foliage looks much more lush on the ground than it did in the pots. Just slightly out of this frame are my bare feet in a cold puddle. It's going to be a quick ceremony this year. The dig begins and one small tuber is exposed. And that's it. One small potato, about 2 1/2" long. Last year, I got only one potato as well, but at least it was fairly sizable. I've been planting the bright green colored vines these past years - next year Im going back to the maroon ones that at least produce cute little multiples. Only barely qualifying for its beta-carotene pedigree, you need a sharp eye to see the slightly yellow ring near the peel in this cross cut potato. So, a disappointing harvest all the way around this year. I grow weary of the Coleus Corner and vow that next year, I'll put flowers in this spot. It won't be much of an event to dig those roots up, though. All I have to do is go to Delaware to collect you, unbolt just enough of your 74" long magnificence to fit into the back of my CR-V and reassemble you in Home Sweet New Jersey. Then my long-time dream of a Redwood Jack-n'-Jill chair of my own will finally be realized. Happy is he who who refused to let go of his aged aluminum umbrella base. Expect 8-rib patio umbrellas to start appearing after each trash day. And look at that rocker (ROCKER!*). Talk about your love at first sight - I didn't even know I wanted it until I laid eyes on it. Its already on my deck and let me tell you, friends, it is one sweet ride. ** If "Red Hat material" can be defined as unbound by conventional expectations and undeterred by public ridicule. I'm coming up next weekend. It's snowball season again. I wrote about this PeeGee Hydrangea bush last year* and I haven't changed my opinion that it is possibly my all-time favorite planting on this property. * In fact, I use the last photo of the mass of flowerheads in that entry as my desktop background image. I have never found a more beautiful image to take its place. You can use it too if you want, unless of course, you prefer the painted deer. 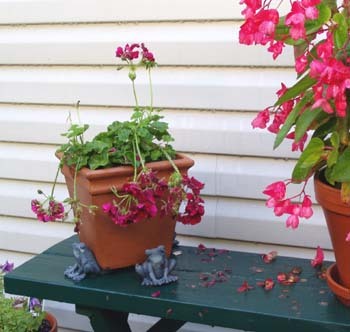 Here are two types of begonias: the common and easy-to-grow wax begonia is in the turtle planter and the beast in the clay pot is called a Dragon Wing begonia. Click the thumbnail to see the stretched-out heart shaped leaves and the big blossoms that hang down. The thing is like a begonia on steroids. I just stuck it in a pot, watered it and let it go. It's very heat-tolerant and always covered in blossoms. It also makes a big mess when those flowers drop off, and since there are so many flowers on it they are always dropping off. Poor little turtle planter. Standing outside through 6 summers and winters has had a bad effect on the finish. Cracks have cracked and flakes have flaked. He might be good for one or two more years, but he's not the boy he used to be. And while we're on the subject, let's say that you were in a restaurant and the waiter offered you the "world's best fish soup". Would you expect to to be served a soup that was made with fish? Don't be naive! 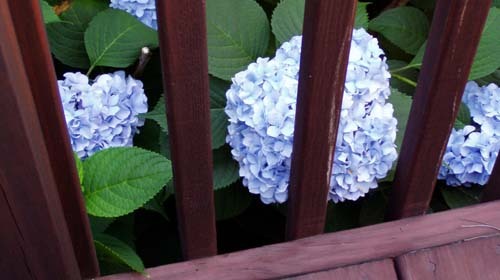 The hydrangeas are a bit disappointing this year - they are usually much more intensely colored. I waited incase they were just immature flower heads, but they seem to be getting even more pale as they age. In other deck news, no one was looking after my deck pots while I was gone to Pennsylvania last week and now there is none of that bushy greenness left out there. I tried to revive what I could with a good soaking via garden hose dragged up onto the deck, but it remains to be seen what did and did not make it. The only certain casualty is the potted New Guinea impatiens which was kind of struggling anyway - even under my careful watch. The rest of it just needs to be coaxed. Also, sawdust. (click) Should I be alarmed? It's those damn carpenter bees. 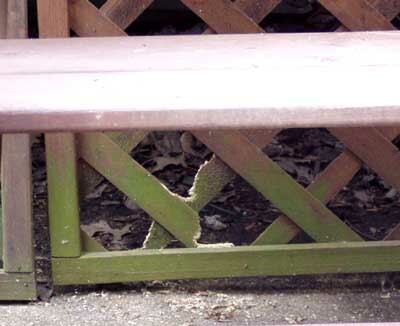 I suppose they like the way I stained the pine benches dark green. Or maybe its cooler on the underside there. Or maybe they like it that they are directly under the place where I park the NPR on weekends. Who knows? It's too hot to worry about it. 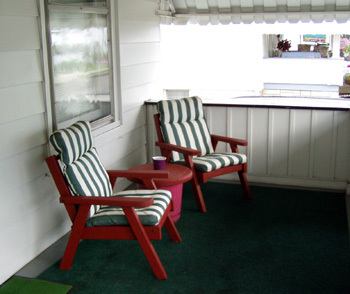 Ok, it's not exactly a deck - it's a front porch. This is the front porch of the old house in Pennsylvania. If I tried, I couldn't possibly count up the hours spent here - reading an endless supply of library books, watching people walk up the street to the church and down the street to the grocery store, listening to the polka music from the weddings at the hall around the corner, hoping for one of the cool older boys to drive past and washing washing washing every part of it. It wasn't summer until the siding was washed. There is not a better place to be during a summer rain storm than sitting on that porch, protected by the big awning and feeling the cool breeze at last, watching the rainwater flow in the street. The most interesting thing about the porch now is that we furnished it with stuff that Mr. Sam collected from other people's garbage*. We painted the chairs and the Lazy Susan** barn red, left the hot pink flower pot alone and invested 79c in a citronella candle bucket. You can see the front porch of the Deerpainter next door. Anything that looks like a flower over there is plastic. I am ignoring her. *Note for future blogger meetings: please do not mention the garbage piles to Mr. Sam - he doesn't like that I tell people about it. He does it, he just doesn't want to talk about it. I used to think it was embarrassing that he did that - now I send him out with specific requests for stuff. They're late this year. The blossoms on the Rose of Sharon usually open on July 1st. Everything else in the garden is off schedule this season so I'm not surprised that this is, too. I bought this flowering shrub when it was just a little stick in a 1 gallon pot at Frank's Nursery. It had a hang tag on it that said "hybiscus syriacus" and no more, so I was pleased when it produced deep pink blossom with double petals. I planned the placement so that it woud provide a dappled screen between our deck and the neighbor's shed, but I planted it years before the deck was built. Mr. Sam was always grumbling about a bush sticking up out of nowhere, as if it was in his way. 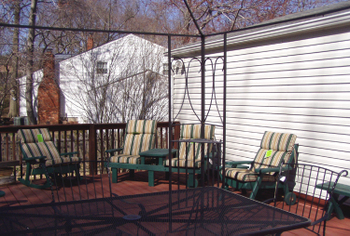 I'm not sure that he appreciates that the placement at the end of the deck is not accidental. He does not care for this plant. 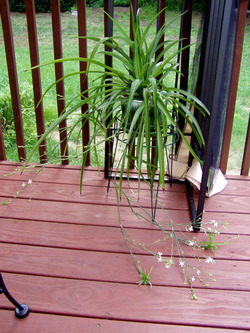 His main objection is that it the weight of the flowers in bloom pull the branches down to hang over the deck. I think that feature is utterly charming. 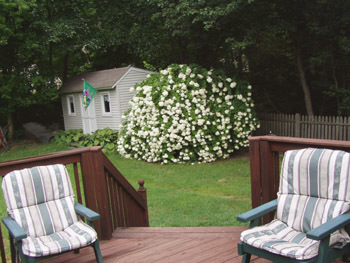 Observe the charming vignette in the photo: the almost tropical look of the flowers that swoon low next to the raw wood of the deck chair and the happy gnome hoisting his beer mug down near the garden path. Who wouldn't be enchanted? The look of that chair appeals to me. 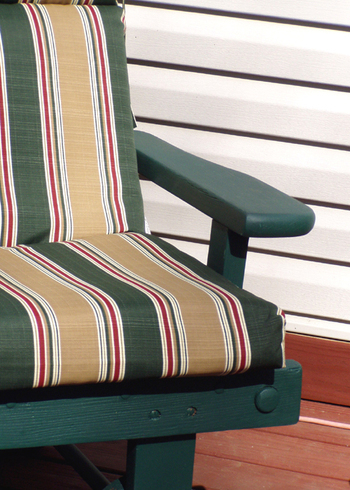 When we bought it, it had a light coating of varnish on it and it was ok, but the plan was always to cover it with the same pine green deck stain that covers all the other wooden furniture out there. A few seasons of sun and snow have scrubbed away that varnish and I like the way it looks just as it is. The bleeding of the nail heads, the unprotected surface of the wood - it is a lesson in the transient nature of things. It fits the garden. The flowers will wither and die, the leaves will fall off the branches, the wooden chair will rot and fall to pieces. That makes the now of everything so precious. 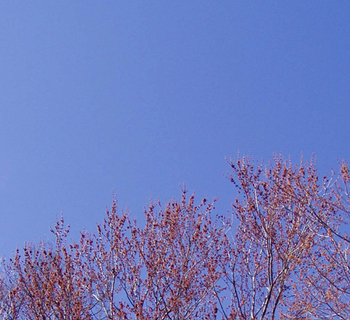 There's a lesson to be read out in the garden and on the deck: Everything is temporary. 1. Disengage one ball of Xmas lights from pile of tangled sets in the garage. 2. Work one end free until you have a knot-free 4 foot length. 3. 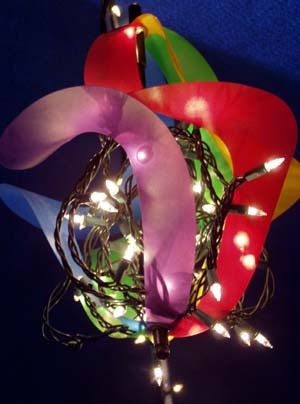 Place tangle of lights inside of the plastic spinner with 4 foot knot-free length coming out of the top. 5. Find somebody to stand on top of the picnic table. 6. Suspend light ball from the peak of canvas canopy. 7. Disconnect orange power cord from weed wacker and repurpose it for festive outdoor lighting use. 10. Pepper conversation with references to "outdoor chandelier". Skip this step if you are speaking to someone who has actually seen it. I am the new gas grill of Mr. Sam! Click my image to bask in the glow of my majestic full-sized presence! I will blacken your all-beef patties and incinerate your kosher franks! Your beer brats will shrink back in terror and the little sausages will cry out for their mothers! "Rare" is not an option! Your brisket will beg for mercy and your ham steaks make me laugh! One word, suckas: nitrites! Death to the marinated chicken legs! I have many knobs and a side burner on which to heat up your disgusting kippered herring snacks which are not allowed inside the house! Your Martha Stewart windchimes will warp and the paint will blister off of your metal TV stand from my intense heat! I will dry out a patch of your lawn from a distance of 20 feet! Gas mark 9! Rawr! We have squirrels, chipmunks, ducks, field mice, tutles, rabbits, birds, muskrats, regular rats, bats, cats, dogs and bees in the backyard and we have grown comfortable with them all, but whatever the heck this is can't be good. Something fat pushed its way between the lattice panels on the bottom of the deck to get under there and then couldn't get out so it started chewing. I hope its gone.